George Ousley, 21, joined the Isaac At team in January 2016. Quickly christened ‘G’, here he shares where his passion for food comes from and who his perfect dinner guest would be. Who/ what inspired you to become a chef? When I was studying music at university I worked in the kitchen at the Prince George pub. I ended up finishing my course early and I didn’t know what I wanted to do, so I took a chance on it really. When I came and met Isaac, that’s what helped make my mind up and I knew I wanted to be a chef. I had never been to a Michelin star restaurant until I joined Isaac At. I didn’t even really know about any famous chefs until I met Isaac, so as soon as I started here I got my head into some amazing cookbooks, learnt about some inspiring chefs pretty quickly and that was it really. I love the level of organisation in the kitchen. I love cooking, but I love the whole package that comes with it. I’ve loved learning all the organisation skills and especially pushing towards Sous Chef level. It’s a completely different world where you’re managing yourself and other people, so there is so much to learn but I love it. Because of the set up at Isaac At, it’s a small space with an open kitchen, so It’s great to be able to see what you’ve created out there with the customers. That’s probably one of the best things, as you can see the end product at the table. When I worked at No. 1 for a few days recently, you couldn’t see anything or where it was going. You basically plated it and then once it had left the kitchen it was gone. And then you didn’t really think about it after that, which is what it’s like is so many places, but what I love about Isaac is you’re part of the whole experience. We’re really lucky because we’re part of a great team, running our own restaurant, so we can do whatever we want without any limitations, which is the fun part. How do you feel you’ve grown as a chef during your time at Isaac At? It’s mad to think about how I was when I first joined the team, I didn’t really know anything. I’ve learnt to understand how to work efficiently and fast. It’s come quite naturally and we’re got a great team so it’s been really fun. You push more when you know everyone else is on the same page as you, which has made me so much better as a chef. Even going to Michelin star restaurants makes you better in itself, learning from some of the best chefs about the whole experience. In the restaurant i’ll watch people, like Isaac, thinking about all the little things that make the whole dining experience what it is. It’s not just the food that makes it special. 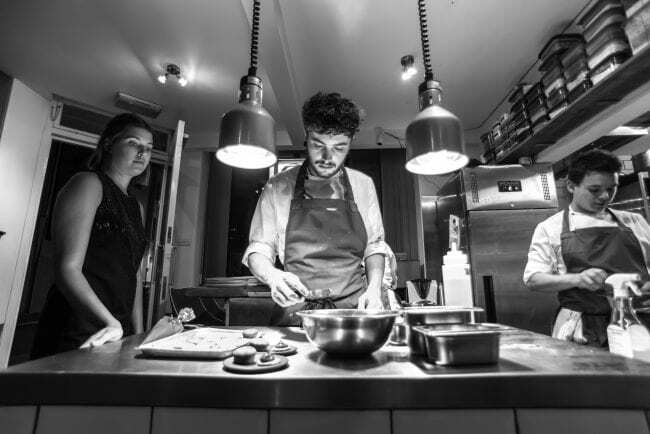 Coming from a pub to a restaurant like Isaac At has given me the confidence to push for more trials at Michelin star restaurants so I can keep learning, which I would never have had the confidence to do before I started working here. At Isaac we always work so hard to get every element of the experience perfect. That’s the thing that’s pushed me the most, knowing that everything has to be really good, even if we’re not fully booked. I’m quite good at being on that, so during service sometimes I can get quite worried about things, watching dishes going out and always caring about what people think. I think that’s important though and that’s what makes the whole experience what it is. It naturally comes and I don’t really think about it too much. What’s your favourite thing to cook? Probably fish to be honest, I think it’s awesome. When you get fresh fish, you literally only have to cook it simply and it’s special. Fish is a lot more delicate and you have to take a lot more care and approach it differently to meat. Dover Sole at the moment is probably the best fish, I enjoy that so much, it’s so tasty. It’s really fun when our suppliers tell us they don’t have a particular fish and then you have to adapt the dish to work with the fish that they’ve got, which works really well because it means you get really fresh ingredients. It’s nice to get it in fresh, prep it and serve it that day when it’s at it’s best. Who would be your perfect dinner guest to cook for at the restaurant? It would be really fun to have Jay Rayner in. I think as a collective we’d all say that. It would be quite nerve-wracking because you’d be fully aware he could rip you apart! I’d love to have some of my favourite chefs in too. Sat Bains is a really cool chef, I love the way he cooks, it’s really modern. It would be great to hear what he thinks of our dishes. Renee from Noma does some crazy stuff. Their way of cooking is so good, superior, taking the best of what you’ve got and making it incredible. I’m really not into over complicating things. Keep it simple. The less you can get on a plate that tastes good is better for me really. I think that’s really important as it’s a really mature way of cooking. You could do all these crazy things with gels and jellies, but sometimes I don’t think it adds anything. That’s what my favourite chefs are all about, really simple with full on flavour. 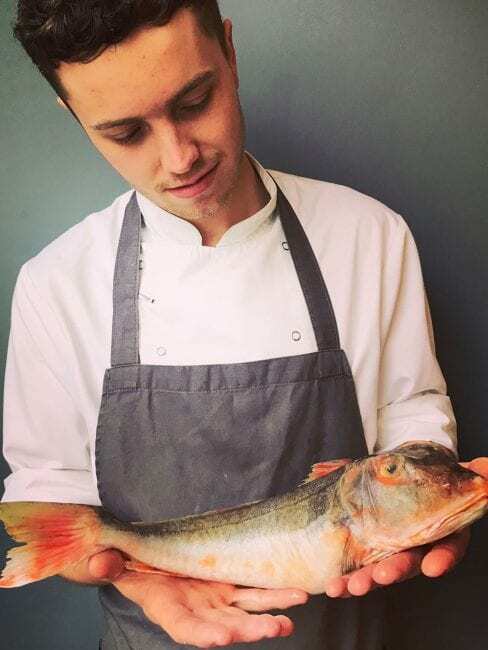 You can nominate G (aka George Ousley) for Young Chef of the Year in the Brighton & Hove Food & Drink awards here. We’d love to be nominated for Best Restaurant, so if you like what we do, we’d be grateful for your support!